This book has been sitting on my shelf since it was released in 2014. Why, oh why did I wait so long to finally read it?! I made a vow this year that I would read more books that I was personally interested in. Still reviewing books, but also taking time to read books that I've purchased over the years that have been left unread...Someone needs to reach out to Natasha Beddingfield to take Unwritten and do an Unread version! Since You've Been Gone was an absolute treasure to read. I immediately connected with Emily because I saw much of her in myself when I was a teenager. I had a wonderful friend that was very much like a Sloane. She just stole the spotlight wherever she went, and that was exactly like Sloane. She was a vibrant character. A flower child. A girl beyond her years. She was a girl that should have been floating around with flowers in her hair right out of Woodstock 1969. She was a wild card and you weren't quite sure where she was going to take you next. Frank, Collins and Dawn were the perfect character trio. Collin's was hilarious. I had many laugh out loud moments when he was firing back with a wise crack, or just being he ol' awesome self! Frank is not your typical brooding character, although he scores many swoon-worthy moments! He is an over-achiever and do-gooder, but once you really get to know him, you'll fall head over heels! This is my first Morgan Matson novel but I have heard countless amazing things about her previous books. After reading Since You've Been Gone I can definitely see what all of the hype was about! Her writing style was easy to read and not overdone. She got into the heads of these teenage character and made them come to life off of the pages. I will definitely be reading her previous and future work! 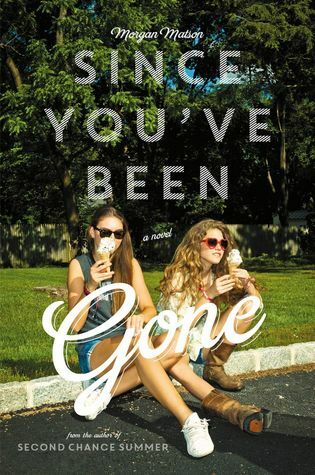 Since You've Been Gone has the perfect balance of all the qualities that I adore in the YA genre. Self growth and discovery, friendship and heart. This book is a great gem that earns a spot on all the YA lovers' bookshelves! Greetings! I like to spend my time by reading books. So I like your site. I like that it always offers something interesting to read. I am hoping the same best work form you in future. But even such professionals as you sometimes need professional assistance, so I want to recommend http://www.custom-paper-writing.org - use their help and be sure in high quality all of your new posts! GIVEAWAY: The Jungle Book(2016) on Blu-Ray!